(2016-06-12, 19:31)tfwise Wrote: [ -> ] Thank you for your reply. I have triple checked my IP address. I don't understand how I am able to stream movies over my network but cannot connect via adblink. (2016-07-09, 14:27)drizzt09 Wrote: [ -> ] why can i no longer find the screenshot button in adblink since name change? (2016-07-24, 20:37)jocala Wrote: [ -> ] What "set up" are you referring to? 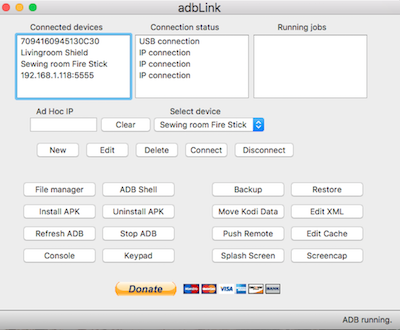 adbLink backs up Kodi using the "adb pull" command, which backs up temp w/o issue here. (2016-07-24, 23:03)ashjf Wrote: [ -> ] Its my own set up, when I use 'Back Up' it will back up media, addons, user data but not the temp filder.